How do different groups work together to stop fossil fuel infrastructure? The Line 3 Pipeline was approved in June in Minnesota, my new home. The pipeline carries carbon intensive tar sands in a time when all science says we must keep fossil fuels in the ground. It continues ongoing exploitation of indigenous communities, crossing Anishinaabeg treaty territories, multiple reservations, and wild rice beds. Honor the Earth, whose mission is to “create awareness and support for Native environmental issues and to develop needed financial and political resources for the survival of sustainable Native communities” plays a lead role in resistance to Line 3, which is ongoing. Recently, Honor the Earth, Friends of the Headwaters, and a coalition of four sovereign Anishinaabe Bands filed legal challenges against the environmental impact statement on the project. I seek to understand how Honor the Earth worked and works with other environmental and social justice groups in MN. I am particularly interested in experiences of Native-lead groups working with non-Native groups, such as 350 Minnesota, who were also engaged in resistance to the pipeline. As a white settler, who has been involved with 350 groups in other states since 2013, I am interested in learning best practices for being a good ally in work for climate justice. In partnership with Minnesota Public Radio, I will be working with colleagues to train students to collect stories from folks in Minnesota about experiences with climate change. The interviews will be broadcast on MPR’s Climate Cast and used for teaching and research. My doctoral research, Working Across Lines, examines the social complexities of grassroots resistance to extreme energy extraction (hydraulic fracturing or fracking, and tar sands). 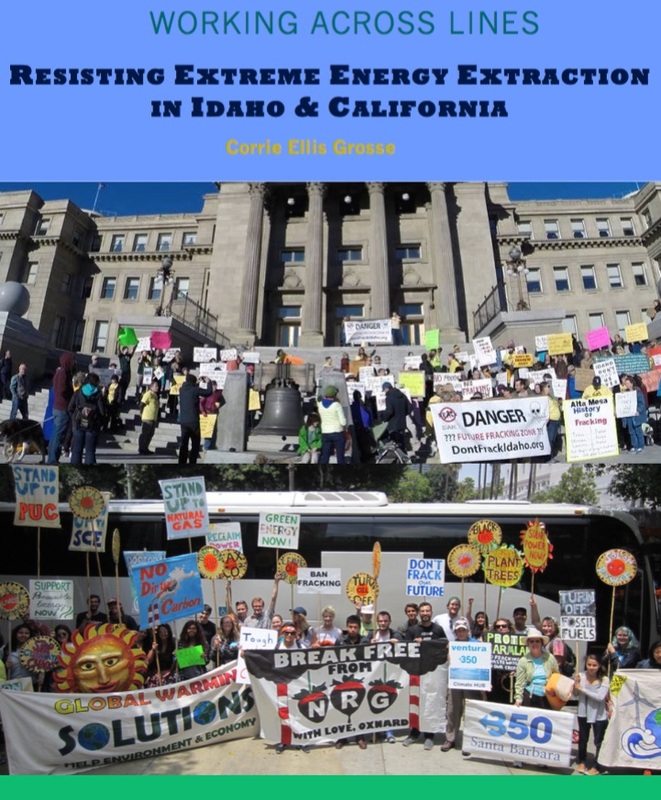 Through 106 in-depth interviews and ethnographic fieldwork in communities in Idaho and California, it analyzes activist motivations and perspectives on building inclusive social movements to prevent extraction and address climate change. I find that activists in both settings, the majority of whom are women, develop strategies and practices that enable them to build relationships and coalitions across lines, whether these are lines based on political ideology, identity, or approaches to sustainability. These strategies entail appealing to the roots of environmental and social problems that activists identify as injustice and lack of accountability and integrity by government and industry. By reaching across these lines, activists are building diverse movements that appeal beyond the typical progressive choir, and thus, have greater potential for growth, impact, and success. Read the abstract and table of contents here.